Medicago’s SSPE buffer is specially formulated for hybridization in Northern and Southern blotting and for wash steps in microarray techniques. The buffer can be used in various applications within molecular biology such as immunocyto-chemistry and cell culture procedures. It is suitable as wash buffer for some cell cultures and for resuspending cells for FACS (fluorescence-activated cell sorter) techniques, in order to attain good cell sorting. 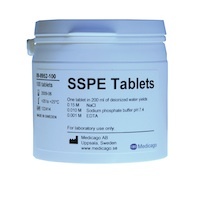 SSPE buffer tablets are exactly pre-weighed and supplied in a pack size of 100 tablets, each tablet giving 200 ml of 0.15 M sodium chloride, 0.001 M EDTA, 0.010 M sodium phosphate buffer with pH 7.4 at 25°C when dissovled in deionized or nulease free water. Deposit one tablet in a laboratory flask or beaker placed on a magnetic stirrer. Add 100 ml of deionized water and stir the solution for a few minutes. Adjust the volume up to 200 ml, stir until full dissolution and the buffer is ready to use. SSPE buffer is shipped at room temperature. Store the tablets in a dry place at room temeprature. Shelf life is three years after production date.